Can you even believe that it is that time of year again? I cannot fathom that in two short weeks Oliver will be ONE and then we have Halloween, Thanksgiving, Christmas and New Years.....boom, boom, boom, boom! Now is the time to start planning for the Holidays and more importantly, how to save yourself the stress of the Holidays. Here are a few things that I think are important in the planning department. 1. Remember all of your stored decorations. Every year, I swear, I buy clearance decorating items for Thanksgiving, Christmas etc and I put it away until next year. Why oh why is it then that I always seem to find these stashed goodies the day after the holiday! I need to make a spot and stick to it. Maybe if I use the same storage place year after year then I simply cannot forget. Genius! 2. Diet. This may seem like a silly reminder but it is crucial for people like me. I love to indulge in food, sweets and drinks during the holidays and no one likes the weight gain. If you start to diet prior to the holidays, perhaps you can knock off 15-20 pounds so you can afford to put a few pounds on during the holidays. Seems kinda counterintuitive doesn't it? Well I call it just plain smart. 3. Start buying your holiday outfits now. I am the kind of mom who just has to have the best looking outfits for my boys for the holidays. I typically buy Thanksgiving, Christmas and Easter outfits. They almost always match somehow and they always look smashing! My mom laughs at me when I tell her at the last minute "oh I can't find the right shoes for Dexter". If you start looking now, chances are you will have exactly what you want when the holidays roll around. 4. 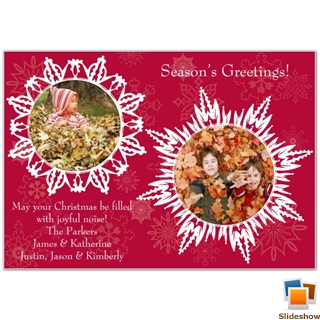 Use Thanksgiving as the perfect time to make your holiday cards. Thanksgiving is a time where we are all typically dressed very nice and the boys are pretty laid back *think full bellies* What better time to snap your family's picture for Custom Holiday Cards then Thanksgiving? Last year, since it was Oliver's first Christmas, I made an exception and I took special pictures of the boys in their Christmas outfits. I used this picture from Storkie and I could not have been more excited with the final product! Everyone loved it! 5. Be flexible. When it comes to bedtime routines and children's schedules, it is okay to relax and go with the flow. I use to be the most uptight Mommy in the world because I felt as though I could never waiver from our schedule and now that Oliver is here I realize that schedules are sometimes meant to be flexible! 6. Clip Coupons. Thanksgiving and Christmas can often times be costly when it comes to decorations (napkins, food, decorations) so shop wisely and clip coupons now. Anticipate your needs and buy when items are on sale so you can avoid the holiday markups later on! 7. Shop online for some of the best deals. I probably don't need to remind you of this but the internet can be your best friend when it comes to shopping for deals. You can price compare with the click of a button, look for promo codes and usually get free shipping! Whats not to love? Also, a lot of store will do price matching in person so look online and print off the prices of products before you shop! Another tip, you can just hide the UPS/FedEx boxes for Christmas which are way more concealed for those curious wandering eyes that may like to ruin their Christmas surprises! 8. Adopt a Kid for Christmas and bring your family together. Starting in September and up until Christmas my family likes to save our change so we can "adopt" a child through the Salvation Army so they can have a nice Christmas too. Saving money and buying special gifts for our adopted child helps bring my family together and reminds us how fortunate we are for all that we have! 9. Halloween Costume Swaps. The holidays can be very costly and one way I like to be green and save some green is by participating in costume swaps. This can be a great one to always get great new costumes for yourself and your whole family. I love being kind to the planet and my wallet all in one fell swoop! 10. Update your address book now so your holiday card list can be sent out without a hitch. I think that receiving cards for the holidays says a lot. I know it isn't green but it is thoughtful and it shows a lot of love is coming your way. Getting the updates on your list now will save you headaches come December!